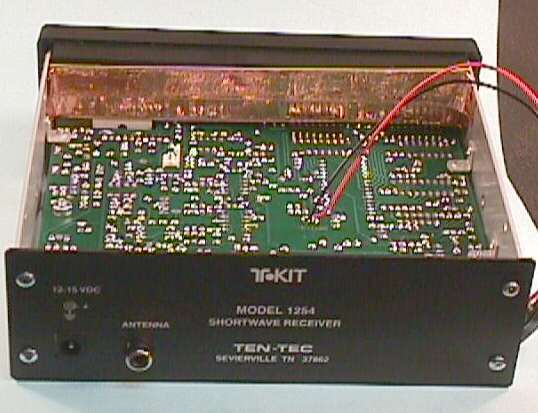 The Ten-Tec Model 1254 General Coverage Receiver Kit was fun to build-- a great kit, and a very good SWL receiver. I'd rate it a four-star kit with three-star difficulty. The building process is very straigthforward, and should present no difficulties to a builder with moderate experience so long as the instructions are followed and care is taken with the soldering. An interesting feature of the building process is that it takes place in stages, with each stage tested before continuing to the next. Each stage checked out as per the docs, but I do have a couple of cautions for prospective builders! PROBLEM! The VCO (voltage controlled oscillator) stage presented a problem, in that the receiver failed to switch from VCO 1 to VCO 2 at the changeover frequency (13.240). After failing to find a problem I called Ten-Tech and walked through some diagnostics with Gary, who eventually told me to re-set the processor. I re-set the processor, and the problem was fixed. Hmmm. Once the processor and display board are complete, the instructions tell you to do a processor re-set IF the display does not indicate 15.000MHz. Mine came right up on 15.000, so I had not ever reset it. If you build this kit, do the re-set even if you don't think you need to! Problem?! When checking later stages the manual describes sounds you should hear, such as "significant increase in noise," "musical tones," etc. Unfortunately "significant" and "musical" are in the ear of the beholder, so to speak! Again I called Ten-Tec, "played" the test over the phone, and was told that all was ok even though what I was hearing was not quite what I was expecting to hear from the instructions. Just a terminology problem, and I was probably a tad gun-shy because of the VCO problem. Plus I was at a point where the instructions say "don't even think about going on if this isn't right" or words to that effect! Potential Problem! The pots (volume control and clarifier) are board mounted, and the volume control goes in pretty early in the assembly process. The docs warn you to be careful because the legs can bend (bend them twice and I expect they'll break). As per normal, I was resting one edge of the board on the desk while installing components, and at some point realized I had indeed bent that darn pot right over. I straightened it, scratched my head for a minute, and grabbed the glue gun, laying in a thick bead of glue all around the base of the pot. Did the same with the the clarifier pot when I got to it, and it worked like a charm. Once the receiver is completed, alignment is very easy, calibration is a simple twitch of a trim cap, and the receiver appears to be rock solid in frequency (as it should be with a PLL) and quite sensitive. 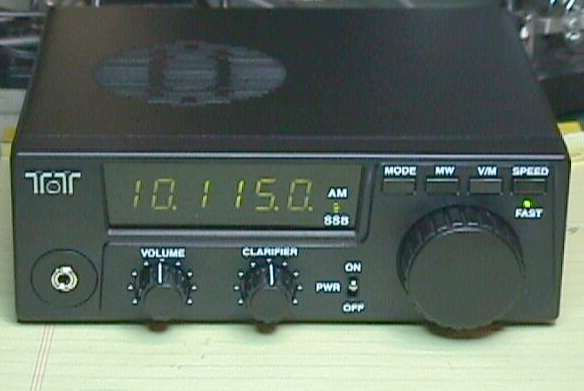 It is an excellent receiver for AM broadcasts, and adequate receiver for SSB, and "useable" for CW but you will probably want to use an external audio filter to improve selectivity. I do have two concerns though. Ten-tec is responsive to users' concerns so please drop them a note (sales@tentec.com ) if you agree with these and feel it's appropriate to do so. Both of these have to do with Ten-Tec's stated objective which is that the 1254 is an SWL receiver, not a "communications receiver." One of these problems has a fairly easy fix; the other doesn't! 1. The VFO stepping rate is either 5Khz (in AM mode) or 2.5KHz (in SSB mode), and a "clarifier" or RIT covers the gap between steps. You discover very quickly that the 2.5KHz tuning is too big a jump. 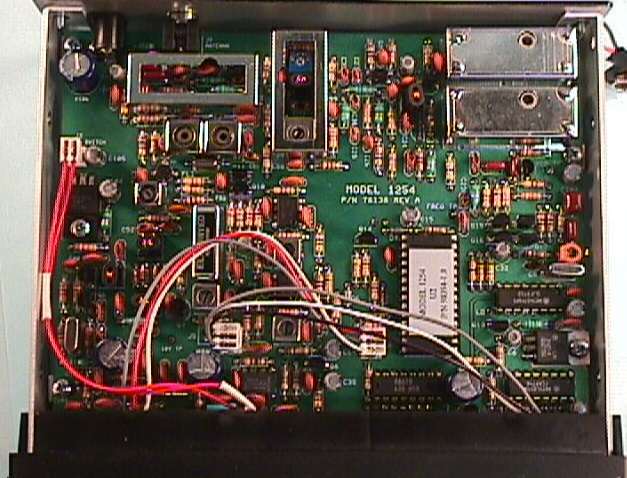 A 1KHz step would be much better (especially for CW) but that would require a change in the program. The PIC chip is socketed, so a mod should be possible without too much difficulty but Ten-Tec won't do it just for me [g]. Also they could use a jumper (as they do in some of their transceiver kits) to provide optional stepping rate(s). 2. The internal noise, primarily from the display multiplexing, is bad. So bad that they tell you to use a coax fed antenna, at least fifteen feet away from the receiver. The antenna line carries dc voltage for an active antenna (e.g. theirs) but again it must be 15' away from the receiver. This seems to me to be a bit counter to the SWL receiver philosphy-- we are used to just attaching any old hunk of plain wire as a receive antenna. It also seems to me that it should be possible to provide adequate shielding and bypassing, and again that should be suggested to Ten-Tec. If any of you have incorporated any mods along that line, please let me know. I added a q&d shield behind the display board, as shown in the illustration, and it seems to have had some effect. The visible wires are for the back up battery; not shown is the speaker shelf with speaker (which also plugs into this side of the board) and battery. The shield is a piece of cardboard cut to fit the space, and to the cardboard I have attached three overlapping strips of copper foil tape, leaving a small margin of bare cardboard at the bottom so that the copper won't come into contact with anything on the circuit board. The tape's adhesive is conductive, so I just left a bit of extra to bond to the sides of the chassis as shown in the closeup photo. It is reasonably secure, but I've also laid a couple of strips of electrical tape across the circuit board just incase the shield falls over! Last mod (so far, anyhow) was to add a push-clip wire terminal for the antenna (and ground) and an external battery clip, which covered up a bit of the printing. 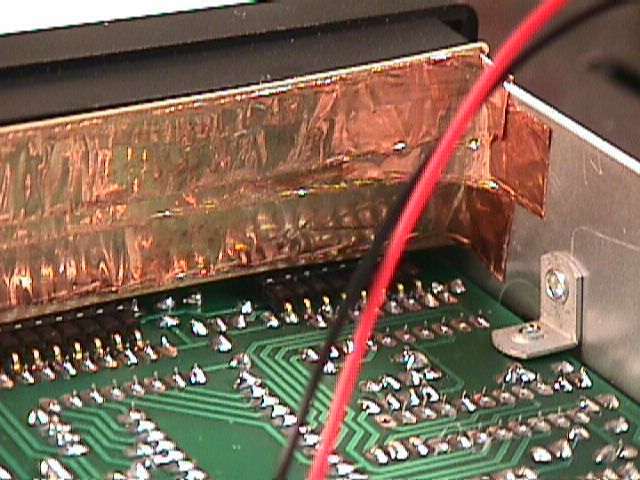 Main purpose of the shielding mod described above was to make it possible to use the receiver with a plain wire antenna, so why not make it easer to connect? I was going to use a binding post, but didn't have any insulated ones, so I went to Tech America where they didn't have any binding posts at all (oddly, RS has 3 or 4 varieties). These speaker terminals are fine, although a large-ish hole is needed for the inside of the terminals. And a ground connection is a good idea. The external battery clip means I won't have to remove the top cover and then the speaker shelf to check the battery, and un-tape it if it needs replacement.